Transportation in the domes and between the domes is available to the citizenry without cost by Ramaxian Citizenry Transport. Mass transit of citizens began in the era of the Second Ramaxian Gen, with the advent of the Rounder, and reached its zenith among the Fifth Gen, with the creation of a levitation transit train, called a SLIDE. Rounder Trams or ‘Rounders‘ are automated minibuses carry 4 to 8 passengers per vehicle. They operate on civil-planned network topology and move in set paths. Street stops exist on pedestrian sidings. Rounders are compartmentalized, they do not connect to mass transport hubs, and serve only interdome commuters. The established routes of RCT came from drawings made by Fifth Gen Primary Pitana Kul. Unlike her kerma before her, Kul hadn’t been the last standing at her Final Trial; she’d been pulled aside when symptoms of ilitux emerged at age 14. Primary Yam Kul insisted that young Pitana did not have the disorder, and decreed she remain in Fleet. To help Kul cope she was allowed weekly visits with one of her makers, Gid Dag. The Bizak architect exposed Pitana to the art of design engineering. After acquiring rank (Pitana was fourth standing at her Final Trial), Pitana enrolled in civil engineering courses in Mynu but was unable to graduate due to being assigned to Port Antarctica by another of her makers, Hizak Pik Gizul, the Prime of Marixi Administration. Years later, after engineers Bulat Utari (Bizak) and Roxal Acari (Hizak) designed the first SLIDE (see below), Pitana Kul, now Primary, submitted an intra-city schematic and proposed a connecting network to operate the Slides. Pitana sought financing from her wealthy best friend (and rumored lover) Fusada Uym, the Fourth Office of the Committee. Uym petitioned the Cloister to finance the final costs of the project with surplus from her office’s municipal transport account. Project InterDome passed onto the engineering firm of Wygz Systems where it became the main lines and stations in use today. System Levitation Intra Dome Slides or ‘SLIDES‘ are rapid transit trains that move through subterranean tubes via levitation on a kyron pulse. 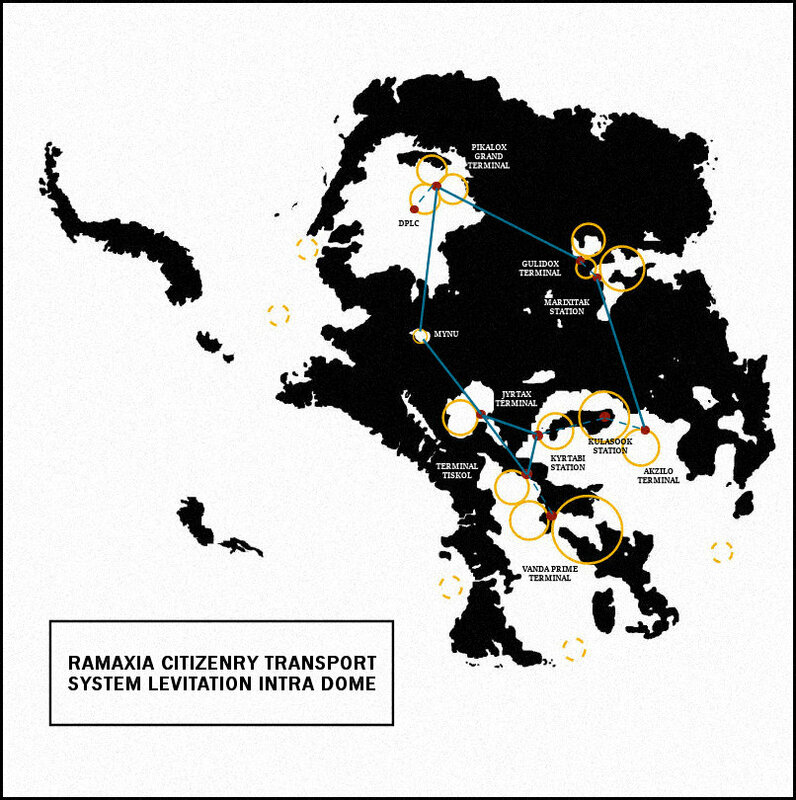 The cells are networked from centralized transport hubs in cities throughout Ramaxia. An average Slide has five cars (the larger bounders have 11), and each car holds a maximum of 21 citizens. PIKALIT: The Pikalox Grand Terminal connects Pikalit to Utama (via Mynu) and houses the only direct access point to the Vosk Glacial Fairgrounds. Pikalox Grand connects directly to Gulidox Terminal in Orta and contains the Dirtoxian Plateau Launch Center. The DPLC is where undersea shuttles are cleared to leave for the waters of the Ramx`atol (Weddell Sea), and it is the only point in Ramaxia where non-military watercraft are allowed clearance to dock. Sliders running out of Pikalox are the Pikalit Inbound and Outbound, and the Orta Slide. UTAMA: Jyrtax Terminal is the heart of Ramaxia’s transport system. Jyrtax connects to all the major cities via the Vantox Prime (to and from Terminal Tiskol in Greater Vanda), the Pikalit Bounder lines (to and from Pikalox Grand Terminal), and the Utox Slide (to and from West Toxis). It also hosts the Turkol Shuttle (direct to and from Marixitak Station in Orta) and houses the Utamx Surface Entry Causeway, for private transports requiring access to the surface. TOXIS: Kulasook Station in the center of Toxis Prime is a vocational hub, allowing those within Toxis to commute between the Toxis domes via the ToxVertical. The Bluzline Main slide runs exclusively between East Toxis and Orta Main and connects the Akzilo Terminal, to Marixitak Station. Kyrtabi Station is the only way in and out of the Toxis domes, for citizens that do not reside in Toxis. Slides operating through Kyrtabi are The Toksul (to and from Greater Vanda), the Utox Slide (to and from Utama), and the local ToxVertical. ORTA: Orta’s Gulidox Terminal is located in the civilian district and operates a scheduled vocational commuter service to Marixitak Station by way of the Orta Shuttle. Slides operating out of the Gulidox are the Orta Slide (inbound and outbound, to Pikalit), and the Turkol Shuttle (to and from Utama). Restricted service is available between Marixitak Station and the Akzilo Terminal in East Toxis. The Bluzline Main carries only Fleet and Divisional officers, with arrival and departure times that coincide with Orta liberty schedules. VANDA: Vanda Prime Terminal is built to connect the domes of Vanda Prime and Central Vanda and operates commuter service to Greater Vanda’s Terminal Tiskol, connecting citizens to West Toxis, and Utama. Vanda Prime dome also houses Bay Vanduel, a central pool of entry and departure for residents living in the undersea Orta stations of Base #2, and Base #3. The Vanduel Central shuttles Vanda citizens to and from Terminal Tiskol. Slides operating out Terminal Tiskol are Vantox Prime (to and from Utama), and The Toksul (to and from West Toxis).